At Sammy J’s Grill & Bar we are always looking for eager, hard working people with exciting personalities, a passion for superb service and an eye for detail. We offer flexible hours, hands on training, competitive wages and staff incentives. Sammy J’s is always accepting applications for all positions and we believe that every person that comes through our front door looking for work deserves a moment of our time. Please feel free to drop by any of our locations any day of the week between 2:00pm and 4:00pm to speak with a manager. If you are interested in a career in restaurants we are looking for you! As Sammy J’s Grill & Bar grows we will be searching for ambitious people that have a passion for the food service industry. We look for people with lots of energy, an outgoing personality and a desire for personal growth. 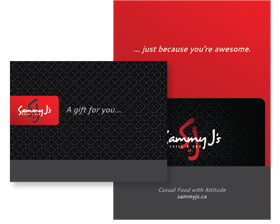 At Sammy J’s Grill & Bar we offer a completely hands on approach to managing. All of our front of house managers spend the first month of their training learning the ropes in our kitchens. Seeing as quality fresh food is the backbone of our business we feel that every manager should have the skills and knowledge of how our kitchen runs. Once through the kitchen they learn not just how to run a shift in a restaurant but how to run a successful business while providing nothing but the highest standards in quality, service and atmosphere.